Of all the advancements that marine aquarists have enjoyed over the years, general testing of aquarium water has been one of the most stagnant areas of improvement and development. If you’re testing the chemistry of your reef aquarium water at home, you’re basically doing the same color changing and titration tests which have been the de facto method of measuring nitrate, phosphate, alkalinity and calcium for decades. Water pumps have gotten smarter, more powerful and more efficient. Various filters, skimmers and reactor designs perform like a dream. Meanwhile reef aquarium lighting technology has become downright futuristic! On the other end of the spectrum, home water testing is essentially stuck in the eighties. So why haven’t we seen the same kind of improvements to water testing that every other segment of the aquarium hobby has enjoyed? A new colorimeter called the eXact iDip whicj works in tandem with your smartphone. It goes without saying that the quality, accuracy and precision of our aquarium water test kits have improved a lot; the reagents are easier to handle, color changes are easier to see and the color scales are much easier to compare. But all in all, we’re still talking about the practically identical chemical reactions, just better made. When I started working in the marine aquarium hobby in the mid nineties, color changing and titration test kits is what we used to measure everything in our aquarium water. However even back then colorimeters were available, but research-grade pricing made them just a twinkle in our eye of what the future could hold. Names like Hach and LaMotte would make aquarium chemistry nerds swoon at the thought of ever being able to use a ‘water testing computer’. 10 years of improvements in colorimeters and the components to build them shrunk the Hanna Multiparameter Ion Specific Meter into the tiny Hanna Phosphate Checker sitting on top of it. Plenty of various electronic aquarium water test kits have been released in the last few years, but when these are regularly used, it is alongside conventional water tests, not the norm. 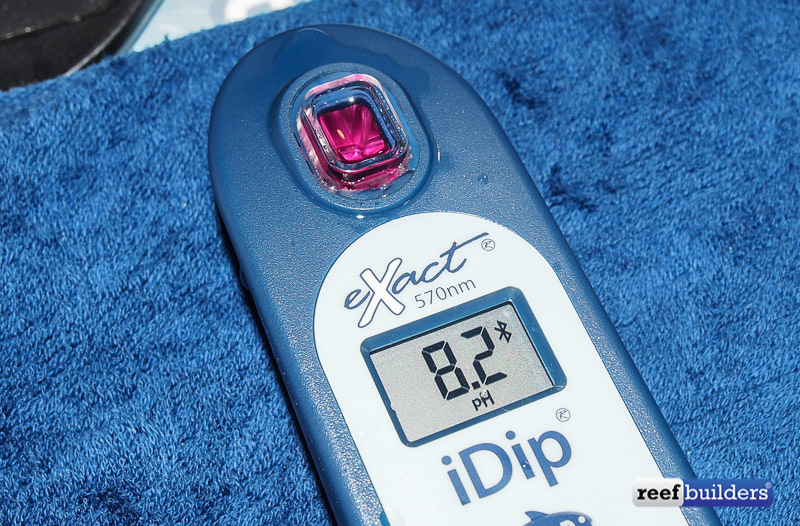 However in the last couple of years, we’ve seen a bigger push than ever to help aquarium hobbyists get increasingly more accurate, precise, and especially more affordable electronic water testing solutions. There are now more options for electronically testing your water than ever before, and things seem to be accelerating on the frontier of home colorimetry. At it’s most basic, Milwaukee and Hanna both offer small hand-sized checkers for basic parameters like phosphate, calcium, pH etc. Aquarium Systems in Europe released the SeaTest Control System which uses a general electronic probe, and JBL’s ProScan measures aquarium water with a smartphone camera. Stepping things up a bit, the Elos Colorimeter 2.0 and iDip both work alongside a smartphone application to make it really easy to control and log tests. And then we have the Seneye and Mindstream aquarium monitors which are web enabled, and allow users to view their aquarium water chemistry in real time, in the cloud. The litany of new electronic water testing devices being made to reef hobbyists today hint at what may be in store for us in the future. All of these products have their place, and each of them will have differing strengths and weaknesses. The Mindstream is particularly tantalizing because imagine, if Step Ahead Innovations can build something like the MindStream Aquarium Water Monitor today, imagine what other new companies will spring up to build new types of ‘mindstreams’ in the future. We believe that we’re finally on the cusp of transitioning away from our drop and titration tests, and that aquarium water testing will be a very interesting space to watch. Do you agree or disagree? Let us know your thoughts in the comments and especially your experience with the new generation of home colorimeter testing devices.